Razor-Fist is a visually distinctive Marvel Comics villain, wot primarily clashed with the Master of Kung Fu. Razor Fist (William Young), the original. Razor-Fist (Douglas Scott), now the “main” Razor-Fist. And William Scott, usually considered the third Razor-Fist. This is his profile. William Scott appeared in a 1981 storyline. (Technically there’s a fourth Razorfist, but there’s visibly no relation whatsoever with the other three). Known Relatives: Douglas Scott (aka Razor-Fist II, brother). Group Affiliation: Former employee of Carlton Velcro. Base Of Operations: Velcro’s palace. Scott is a large, powerful fighter, with his right hand replaced with the signature Razor-Fist blade. The blade, his muscles and his mass allow him to cleave through thick wood – and presumably through stone. Pavane thought all three Razor-Fists were triplets. She was wrong – William and Douglas Scott are neither related to the first Razor-Fist (William Young) nor twins. What did happen is that the Scott brothers had an accident that cost them both a hand. They were soon approached by international crime lord Carlton Velcro. Velcro offered to turn their handicap into an asset by making them both the successors of his henchman, the original Razor-Fist. Given this timing, it is possible that the accident had been engineered by Velcro specifically to turn the suitably large and muscular Scott brothers into Razor-Fist II and III. Thinking of the sociopathic Velcro as their benefactor and loyal employer, the Scott brothers took his offer and started training. In 1981, William was sent to Hong Kong. Velcro had spotted an opportunity to gain revenge on the men of Sir Nayland-Smith, who had caused untold damage to his drugs empire some years before. One of these agents was Shang-Chi, who had killed the first Razor-Fist. 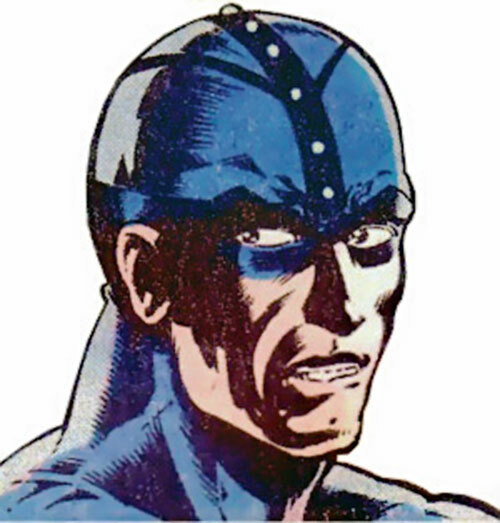 An ally of them was the mercenary Pavane, whom Velcro accused of having betrayed him. 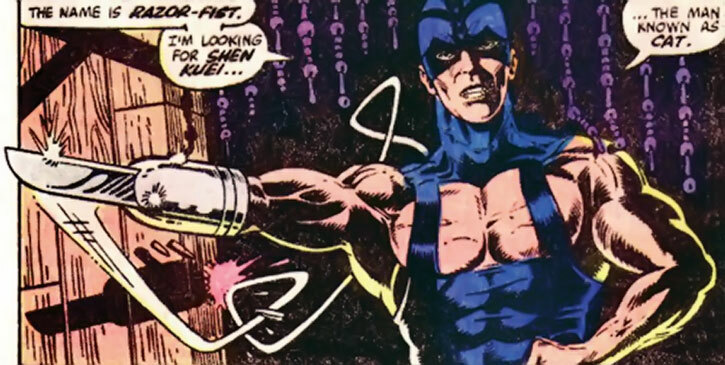 Word on the grapevine was that Shang-Chi had allied with the legendary thief and mercenary, the Cat (Shen Kuei). 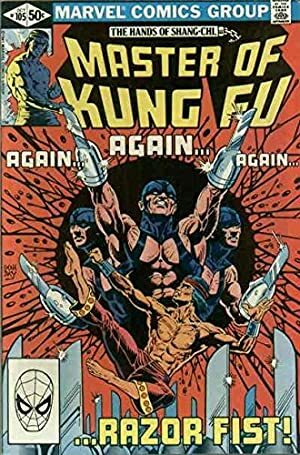 Razor-Fist III roughed up, maimed or killed several known followers of the Cat until they told him what they knew about Shang-Chi and Pavane. They agreed to talk as long as they did not betray the Cat. In return Razor-Fist released an innocent woman whom he had been holding hostage. Razor-Fist then returned to Velcro’s base. Other agents were dispatched to deal with Velcro’s enemies, based on the intelligence William had just collected. Among these agents was Douglas Scott, who went after Pavane. He did not come back from this mission. William feared that Douglas had been killed by Shang-Chi. When Shang-Chi and Leiko Wu later attacked Velcro’s base, Shang clashed with William Scott. Scott accused the Master of Kung Fu of having killed William Young and feared for the life of his brother. Shang-Chi told him that the murderer of the first Razor-Fist was actually Velcro. The third Razor-Fist sensed that the Master of Kung Fu was sincere. Thus, he asked the nearby Velcro to tell him the truth about William Young’s death. 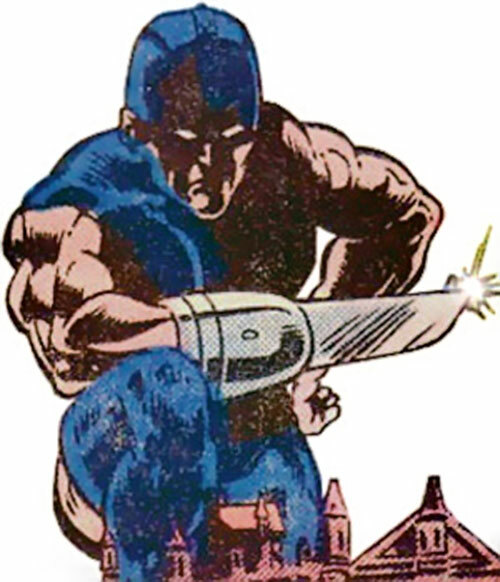 Panicking, Velcro produced a firearm to kill Shang-Chi but hit Razor-Fist right in the heart, killing him instantly. It is possible that the official Marvel identification of which Razor-Fist is which in each story is incorrect. If so, then Razor-Fist III did survive and appear anew. See the entry for Razor-Fist II for further discussion of this. Dour and loyal, with a violent but disciplined temper. Creepy Appearance, MPR (Missing his right hand). Razor-Fist III officially appeared but once, so his stats are somewhat speculative. – Slashes — Strength-based Slashing Damage 4. – Deflects blows and projectiles — Enhanced Parry 2, Enhanced Dodge 2. – Cleaves through weapons — Improved Smash. – Looks frightening — Intimidation 3 (+4). Close attack 3, Defensive roll 3, Improved critical (Bladed Attachments) 2, Improved Smash, Power attack. Athletics 4 (+7), Deception 1 (+2), Close combat (Bladed attachments) 1 (+11), Insight 3 (+4), Intimidation 3 (+4), Perception 4 (+5). Disability Missing his right hand. Trade-off areas Attack & Effect PL 9, Dodge/Toughness PL 8, Parry/Toughness PL 9, Fort & Will PL 6. Point total 66. Abilities 26, Defences 17, Skills 7, Powers 0, Devices 7, Advantages 9. Equiv. PL 5. Source of Character: Master of Kung-Fu v1 #105-106 (Marvel Universe).